We offer a lovely selection of single Gem & Crystal Essences, from Abalone to Zoisite. 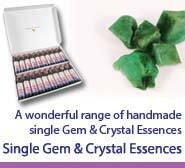 This extensive collection makes a wonderful resource for anyone who enjoys using Gem & Crystal Essences - either for themselves or as part of a professional practice. Use singly or combine to create your own combinations. Gem & Crystal Essences can work deeply into patterns & issues and will often carry an energetic resonance that will remind your subtle energy bodies how to be in balance and healthy. Each Essence holds a particular vibrational frequency or energy which helps to release & re-balance old patterns,energies, thoughts & emotions. Enhances intuitive abilities and promotes discernment & recognition of truth. Past life memories, Egypt and sun worship. Increases the capacity for clairvoyance. Stimulates cleansing in the subtle bodies, particularly the mental body. Promotes intellectual & spiritual illumination. Promotes access to new dimensions & possibilities within the self. Stimulates interplanetary communication.